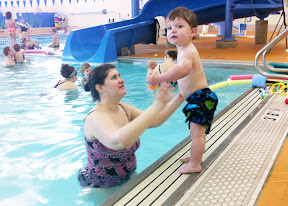 Luke had his third week of swimming lessons. Even though the heater in the pool was working this week he still come out of the pool with blue lips. 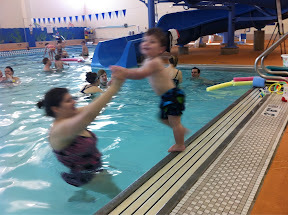 Mom took Luke into the pool this week; I handled last week. Luke seemed to be enjoying himself. His favorite activity was being put on the side of the pool then jumping into Mom's arms. Other favorites included riding the last few feet of the slide into the pool. 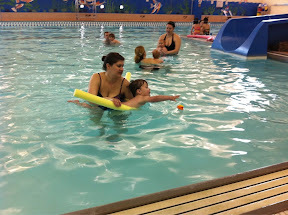 Besides being familiarized with the pool some rudimentary swimming skills are being learned. Luke gets a toy and throws it out in the pool. Then Mom holding him by his ribs basically helps Luke crawl in the water toward it. Luke is getting pretty good at it. The final learning experience Luke had today was that you shouldn't pout in the pool. He was unhappy about something and hid his face in his hands. Well his hands were in the water and he plunged his face in right after them. Needless to say he wasn't pouting for long as his face came flying out of the water.